Were there any faculty members at New Paltz who you connected with as a student? 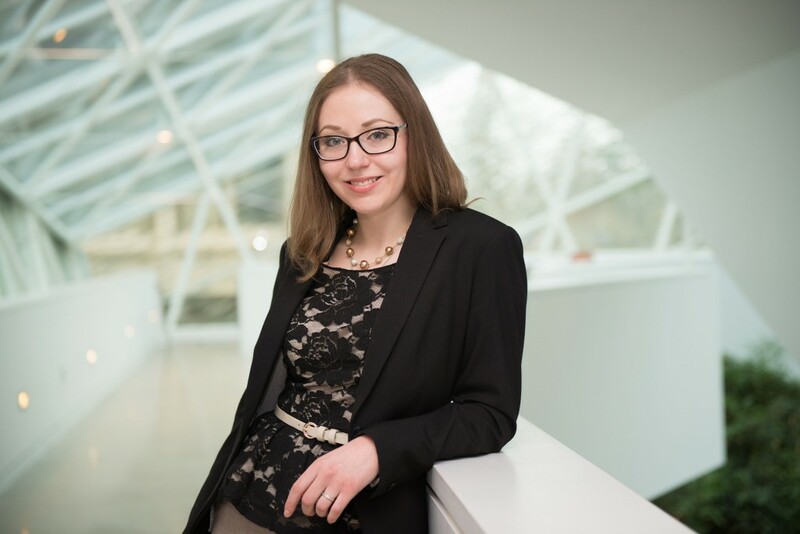 Since my freshman year, I was taking some upperclassmen courses with Dr. Natalie Cartwright from the math department, who developed my strong passion for applied mathematics. I ended up doing a couple of independent studies with her in some specific areas of mathematics that were not offered at the school. Dr. Cartwright also oversaw my research. 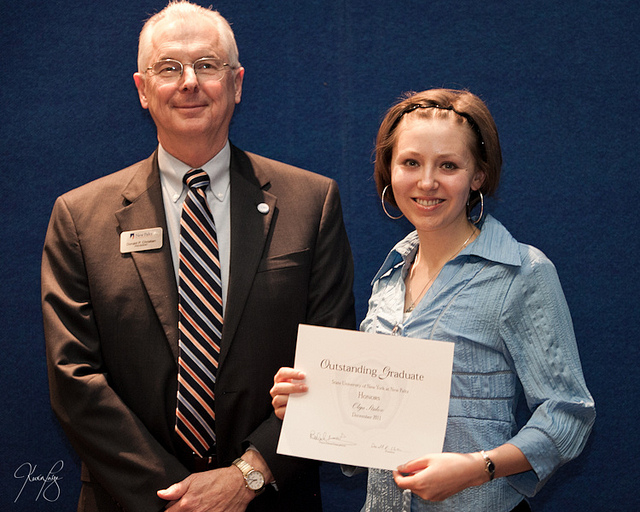 My learning experience with her culminated in the senior design project required for my electrical engineering degree. I was allowed to do a project that utilized both of my majors, and Dr. Cartwright acted as my math advisor. I’m very thankful to her for all the teaching I received from her. She really was an extraordinary influence during my time in New Paltz. 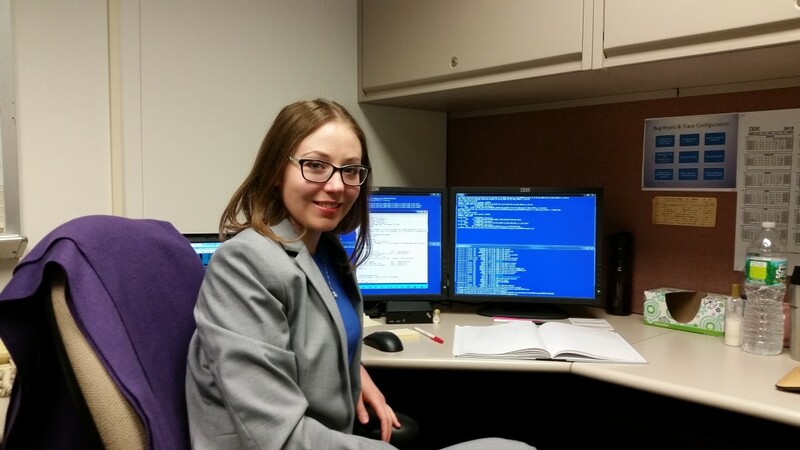 Olga working in her office at IBM in Poughkeepsie, N.Y.
Why did you decide to attend New Paltz? on the top SUNY schools in this major. SUNY New Paltz is well known for its business school, and that led me to apply. When I came to visit, I fell in love with the beautiful campus. I loved the fact that New Paltz was a small school with small classes where my professors knew me. This gave me the opportunity to gain a more in-depth education, as the professors could dedicate more of their time to each student. Since I graduated New Paltz, I received my master’s degree in applied mathematics from the University of Washington in Seattle. I then worked with adjunct professor Gary Bischoff at his company, Electronic Control Concepts (ECC) in Saugerties, N.Y. That opportunity allowed me to apply the knowledge I gained from SUNY New Paltz in a practical work environment. Since then, I have attained employment at IBM, working on their zSeries mainframes at the Poughkeepsie location. How did your education prepare you for your duties at IBM? 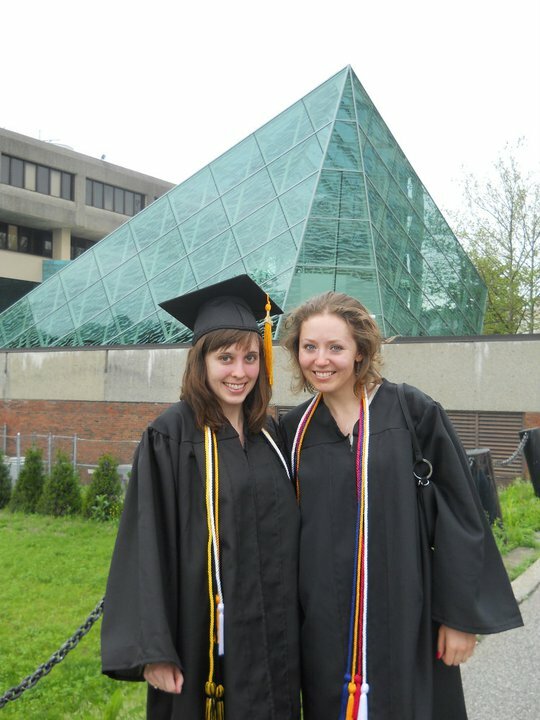 Olga (right) with friend Nicole Cooper ’11 (Secondary Education in Mathematics) in front of the Atrium on graduation day. New Paltz gave me confidence in tackling complicated tasks and projects. My studies gave me the skills necessary to overcome obstacles that occur during my regular work day at IBM. I truly believe my professors, as well as the school as a whole, prepared me for the rigors of working at such a high-level company. What advice would you give someone thinking about attending New Paltz? If you decide to go to New Paltz, you’ll have a great time there. You will receive a great education at an affordable price. The personal attention you receive will definitely help you grow, and you will graduate knowing you are ready for a successful future. Don’t let the studies take over all of your time. New Paltz is located in a beautiful area and should not be missed. I would also recommend joining some of the fun clubs or sports teams. Being part of the cross country team made me feel like I belonged. In my free time I take Tang Soo Do and Brazilian Jiu Jitsu classes, spend time with friends and family, and read books about people whose lives I find inspiring. I also greatly enjoy nature, playing piano, and playing with my puppy (my very first pet).